A number of Elf bags are now available for purchase from my Storenvy store, along with a whole lot of other Chromatophobic jewellery and decorative items. 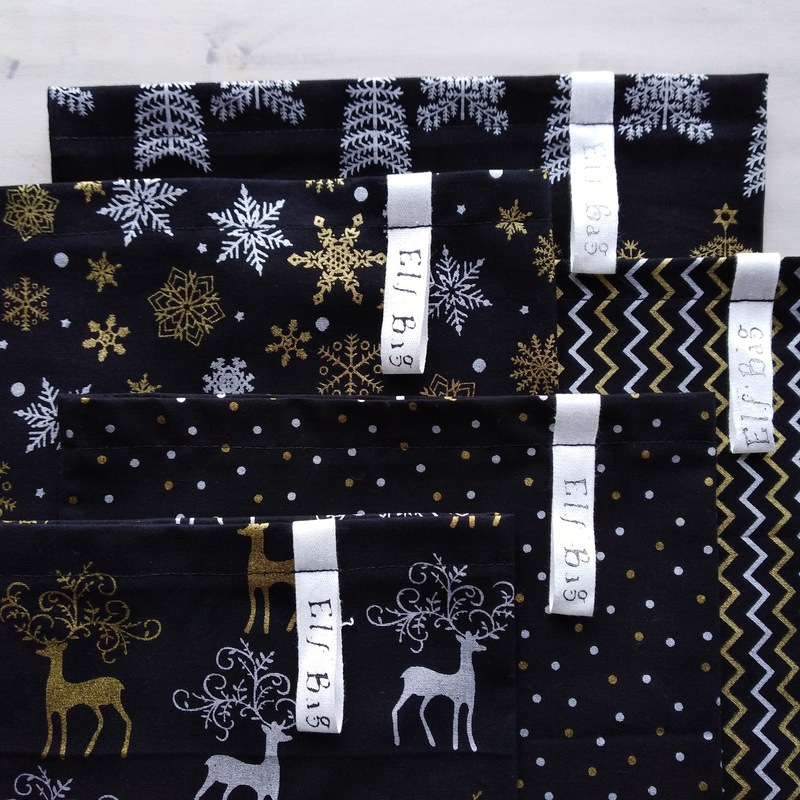 The range of Elf Bags has now been properly updated in the gallery, prices included. 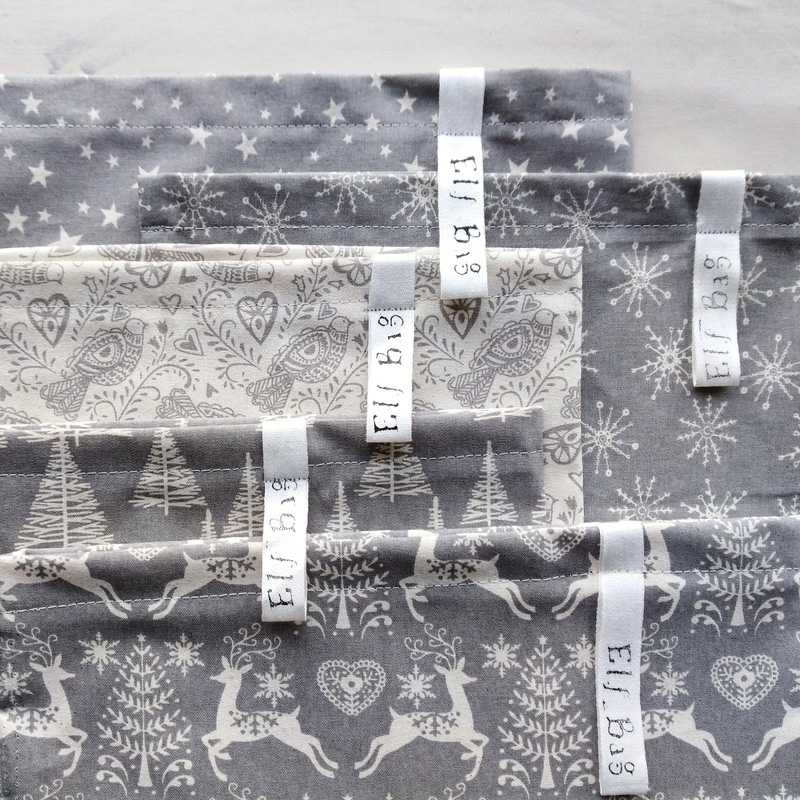 Get in touch if you'd like to say goodbye to wasting gift wrapping paper! 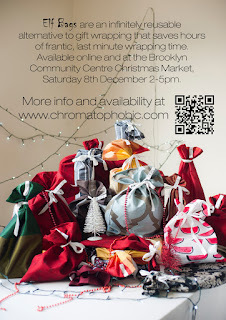 Tomorrow I'll have a stall at the Brooklyn Community Market. My stall will be blanketed with Elf Bags, Grimly jewellery and other cool things that make awesome presents for people you don't dislike. On average, Kiwis throw away 30% more rubbish over the summer holiday period than usual. The waste we generate just about doubles the week after Christmas. An extra 50,000 Tonnes of waste is likely to be produced during the Christmas week. A 20-foot container is able to hold on average 3.5 tonnes of waste (50,000/3.5 = 14,285.7 containers). With each container standing 2.4m tall, stacked on top of one another, this would be equivalent to 105 times taller than the Sky Tower. This means the amount of extra waste generated the week after Christmas in NZ is equivalent to more than 14,000 20-foot containers stacked on top of each other, 105 times taller than the Sky Tower!! 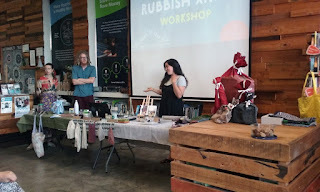 The workshop hosts, Hannah and Liam of the Rubbish Trip effort, kindly invited me to talk about Elf Bags. The event took place at Sustainability Trust, and I walked around the shop to find bits and pieces to gift bag as exemplars: bokashi bucket set, gardening tools, rat trap. The walking and looking part took far longer than the bagging part. I'm glad I wasn't talking about some upcycled, hand-made wrapping paper. Nothing wrong with that idea, but gift wrapping those oddly shaped items would have been a pain. Hannah and Liam are giving two more talks in Wellington before they take off on their South Island Rubbish Trip for another six months. 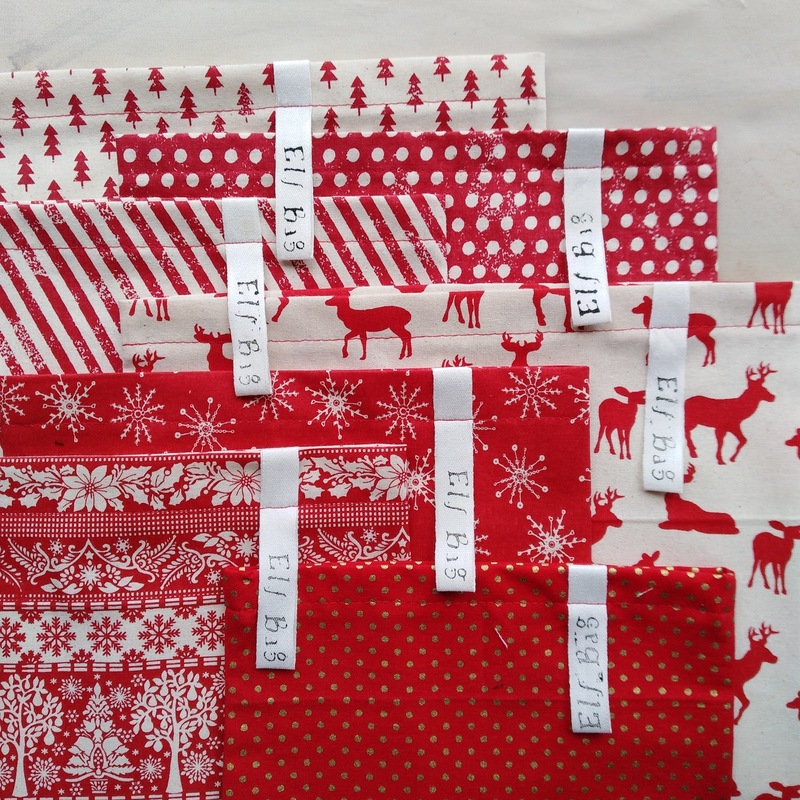 If you have some fabric you're particularly fond of, I'm happy to sew custom Elf Bags for you. 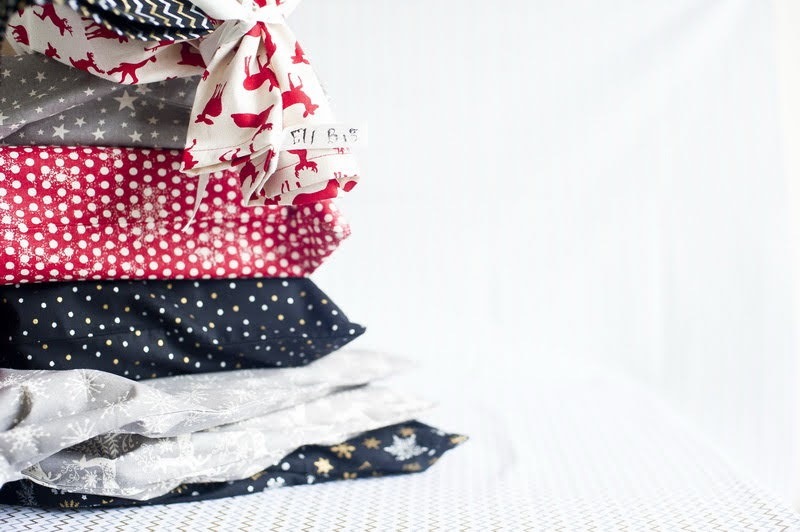 Elf Bags are an alternative to gift wrapping, so they will most likely be used only for birthdays and other gift-centered celebrations, and with good care, should last for generations. That's generations of not forking out on wrapping paper every year. You might need to wash an Elf Bag once a decade or so, which means that precious fabrics of high sentimental value but little practical application are perfect for this purpose. Oh look, a decorative snowflake. I make those, too. Perhaps you have your old baby blanket that will never snuggle another baby, but it's a shame to feed it to the moths in the attic. Maybe your kids have grown out of their cutesy dinosaur curtains, and the curtain edges are too sun-faded, and they are too old to give away, but you want to hold on to the fond memories of curtain peekaboos and infectious giggles, and it's fun to test the progeny's knowledge of Dracorexes vs Eoraptors when the are twenty. You might have some hideous holiday shirts that are too offensive to wear, but their nostalgia value is phenomenal. 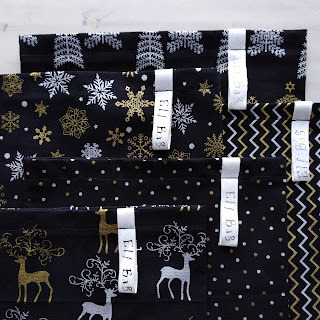 How about those neat decorations for your custom Elf Bag? There's that psychedelic tea towel that your, now deceased, uncle gave you ten years ago. You never actually used it, but it seems disrespectful to take it to a charity store. Show your relatives that you cherish the memory of your eccentric uncle by transforming the towel into a gift bag to sit under the family Christmas tree. How about your grandma's selection of novelty scarves? That Christmas table cloth that got a massive hole burned in it by a rogue firework that your inebriated cousin let off last year? Grandpa was not impressed. Only a third of the table cloth is completely wrecked. The other two-thirds, made into Elf Bags, will remind your family about the fireworks incident. That might keep the cousin from drinking too much this year, and Grandpa can find someone else to swear at. An Elf Bag can have a family story to tell. A funny story or a really weird one; and every year, when the gifts are bagged under the tree, the stories are retold and new tales join the family history. Santa has a big sack. It's full of naughty children who accept sweets from bearded strangers in eccentric attire. 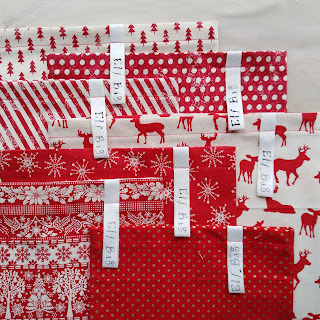 If you need some inspiration, have a look in the gallery for examples of ready made Elf Bags.